The list of possible activities where the survival pack is useful makes it not only a man's multi-tool kit. It can help every woman to settle any problem by herself. This mini multitool kit is equipped with a standard set of tools and completes the same everyday tasks as those big tools but saves much storage space. Imagine that you have an effective and easy to use tool kit that can be worn on your belt, in your pocket, in a backpack or in a special bicycle or car section. Comfortable and functional utility tool. It copes well with any task: cutting, sawing, and opening and so on. One of the special features is shaped pliers, which make delicate work, like snipping a wire, and also catching and manipulating in a comfortable and simple way. An additional important function of this tool is a bright flashlight. The high quality materials provide this multi tool kit with optimal reliability and durability. Best selling multitool. No need to ever buy another multi-tool again! Free sturdy case comes with a multi-tool. Multi-tool holder protects the gadget from damage and lets you wear it on a belt. Multi use tools. By using this multitool, you'll always be ready to manage with any problem anywhere and anytime! Dream of all boys gadget fans. 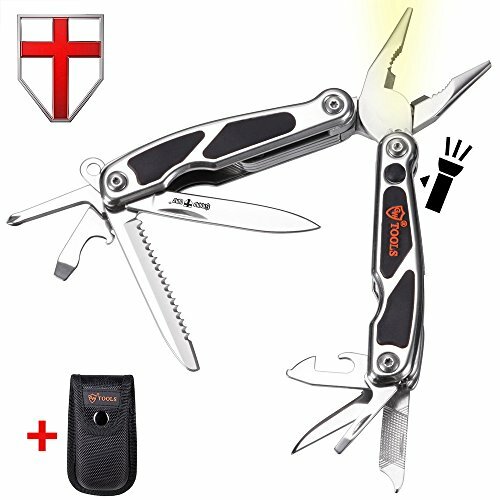 MULTIPURPOSE TOOL WITH 11 FEATURES - flashlight, spring-loaded pliers, wire cutter and stripper, folding blade knife, serrated blade, can and bottle opener, metal file, phillips and flat screwdrivers, scraper and an awl. It is a true multifunction tool. COMPACT MULTITOOL FOR ANY PURPOSE - Camping, Hiking, Backpack, Hunting & Fishing, Military & Army needs, Outdoor & DIY Activities, Survival, Self Defense, Emergencies by carrying in a pocket, pouch or tool box. It is also easy to use as a car or a bike repair multi-tool and saves much space. MADE OF 440C STAINLESS STEEL - excellent balance of hardness and corrosion resistance ensures proper operation without sharpening. Provides razor sharp cutting performance and high durability. COMES WITH FREE SHEATH - this solid and practical holder has a belt loop and is made of heavy duty cordura fiber. 100% MONEY BACK GUARANTEE - your new all-in-one tool is protected by Grand Way 10-year warranty. A perfect gift for a man or a woman in your life.